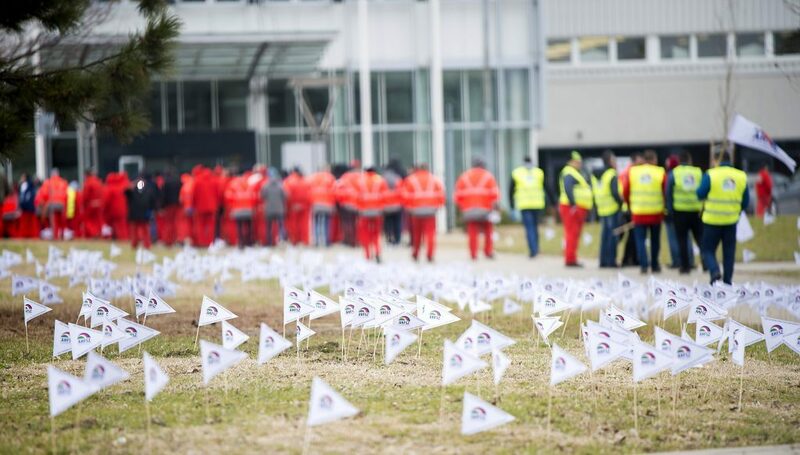 Employees of Audi Hungary in the western city of Györ conducted a successful seven-day strike in late January. It was the AHFSZ (Audi Hungaria Independent Trade Union) that led the strike. The AHFSZ currently has 9,700 members in the plant (72% of the workers) and defines itself as a “union independent from all political parties as well as from any Hungarian trade unions or federations”. Members of AHFSZ kindly agreed to answer Philippe Alcoy’s questions. The workers of Audi Hungary in Gyor went on strike for seven days on wages and working conditions and won a great victory against this global giant in the car-manufacturing industry. Can you explain us how it started and why workers decided to strike at this moment? We had a contract with the company until 31 December 2018. The negotiations started in autumn 2018. Unfortunately, however, the employer was determined not to be constructive. It happened that several weeks went by just to make some issues clear for them. The AHFSZ defined its payment demand for the year of 2019 at the annual conference on 9 November 2018. The negotiations continued, however, and our positions remained as distant as ever. The Board of the Representatives of AHFSZ decided to form the Strike Committee on the 14 January 2019 since the employer had not moved positively towards its earlier pay rise offers. The Board decided to hold a 2-hour-long warning strike on 18 January 2019. The successful 2-hour-long warning strike emboldened the Strike Committee to announce a 168-hour-long strike from 6.00am 24 January 2019 since the negotiations had not gone well. We know that there have been big strikes in the region, with struggles in car industry (but not only there). Did you follow these developments? Did those strikes have any effect on you? factors. We have to make it clear that the strike we organised took place in the plant of the car factory Audi and it involved only the pay rise for the workers of AUDI. We were able to carry out such a strike because we are an independent factory union and we are not a member of any association or confederation. Still, without any doubt your strike was closely watched by the workers of Volkswagen group in other countries, and even by those working in other groups of car industry in the region. We know that you received solidarity from unions like IG Metall from Germany. Can you explain it? Did you receive solidarity from other unions or workers from Hungary or from abroad? How did Audi workers experience this solidarity? Does it suggest a change regarding working together across borders? And do you think your strike can encourage other workers in the region to follow your example? We received plenty of solidarity declarations from unions in Hungary and abroad as well, for example, from the employees of the Italian car factories Lamborghini and Ducati. Furthermore, we could mention the employees of Mercedes working in Kecskemét, Hungary. Unions from other industry sent their solidarity as well. We believe that other unions can learn from our example. However, it has to be emphasized that a well-organised unity on the factory level is the main condition for a successful strike. This unity we built at our plant was incredible since all employees stopped working during the strike, and 4000-4500 employees took part in the informative gatherings in one shift. In recent years, many of the Gyor workers have gone abroad for training. How has this affected worker’s awareness of their conditions in comparison with other Audi and Volkswagen workers in the region, and connections with other unions and workers internationally? We keep in touch with other unions from abroad and we regularly exchange our practice and experience. The Gyor Audi factory is the largest factory in Hungary (employing 13,000 people and counting for 1.5% of GDP. It has become the largest foreign investment in Hungary since it was established in 1994). How do you think this strike will affect other workers in Hungary? This question cannot be answered with a definite yes or no. Time will provide the reply, however, we hope that our strike has given courage to other workers at other workplaces to stand up for their rights. You fought for an increase of wages but also to obtain more vacation days. The claims of workers for more time to rest and for free time are becoming very important in the country and in the region, why? It has drawn people’s attention in Hungary as well that we demand one free weekend for all of our workers. Most of the people in Hungary take it for granted that this one free weekend is provided for all of our workers. However, unfortunately, it is not like that with us since there is a special shift system when a worker can get a free weekend only every 7 weeks. That is the reason why we fought for this right. What can you say about the role of female workers in the strike? In the videos and photos of the strike we saw a number of them among strikers. We would like to add only one thing. During the strike we were asked several times if our support declined as time went by. We can proudly claim that the number of members was 8,900 at the beginning of the strike whereas at the end of it – at the time of the signature of the payment agreement – this number had increased up to 9700. The support for the union has been rising ever since as well.